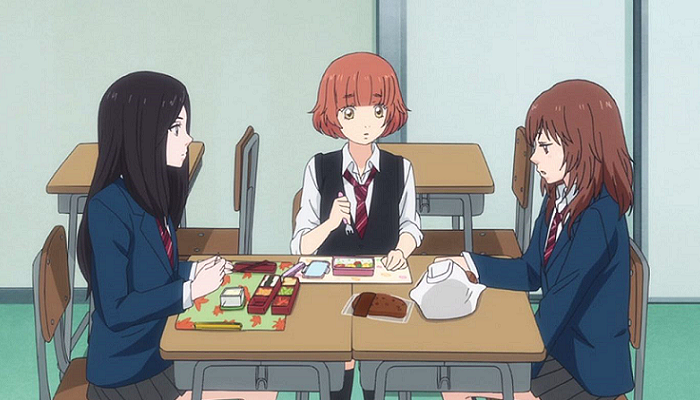 The Ao Haru Ride anime revolves primarily around 6 characters as the story unfolds. By following them, it's evident that they all have their own unique qualities, as well as characteristics developed along the way. 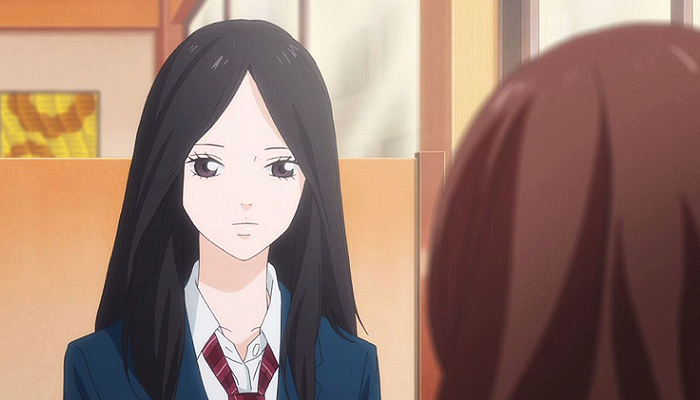 Meet the adolescent cast of Ao Haru Ride! Originally a very feminine and meek girl in middle school who hated boys (except Kou), Futaba decided to change her image as she entered high school to one that would allow her to create a circle of friends. At a glance, Futaba does whatever it takes to fit in, especially if it means deflecting all attention from her. This includes buying a very large lunch, being unusually loud and clumsy, keeping her hair slightly unkempt, not wearing make up and agreeing with whatever her "friends" think, as long as her actions do not create conflict. Thus, the Futaba we see at the beginning of the series comes off as a little bit desperate to belong somewhere and afraid of being alone. But, it's quickly revealed that her sense of morality is strong as she stands up to her fake friends when they say mean things about Yuuri, her classmate, behind her back out of jealously. This leads to Futaba being kicked out of their group and alone again. Despite this, Futaba's high school persona has been entrenched and she remains un-girly even though she no longer has to put on a charade. In the next semester, she soon befriends Yuuri as they stay in the same class, as well as Shuuko. Through her interactions with these characters, we can see that Futaba is caring and sensitive to the way her friends feel. In particular, she hesitates admitting her own feelings for Kou if it means hurting Yuuri, and is persistent in trying to break down the wall that Kou has built around himself to ease his grief. Futaba's sensitivity to the people around her however, means she is inclined to hide her true feelings or hold back from what she really wants to say. This occasionally leads to misunderstandings and frustration. She is also quick to jump to conclusions and is in many cases stubborn. Although she is deeply in love with Kou, at one point in the manga storyline (which is not covered in the anime adaptation), Futaba begins dating another student, Touma, to try to move on from him. Despite not actually liking Touma romantically and having lingering feelings for Kou, she forces herself to like him, dragging out their relationship. This is further fuelled by a misunderstanding in which she sees Kou out with Narumi, a friend from his middle school days in Nagasaki. The major challenges that Futaba faces in her springtime of youth include being honest to herself and breaking out of her assumed identity and her anxiety to fit in. She is able to do this early on in the series after her initial encounters with Kou as he voices his observations about her and the people she surrounds herself with. Through this, Futaba shows the empathy she holds for others by standing up for Yuuri. 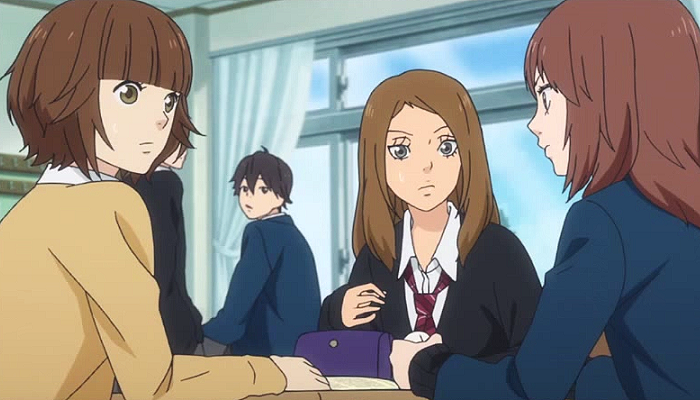 Kou reappears before Futaba in the latter half of their first year of high school. The Kou she remembers from middle school was quiet, shy and kind. The Kou that we are introduced to is cold, detached, reluctant and slightly pessimistic. Traces of the old Kou remains as he keeps the old habit of covering his face when he's embarrassed. He also continues to tease and act playful with Futaba, the only person he behaves as such to. The reason for his detached behaviour and the distance he places between himself and the people close to him, including his own brother, stems from the trauma of losing his mother when he was in middle school. Afraid to lose someone he holds dearly again, he keeps everyone at arms length. He often wanders around in the evening hanging out with "friends" in town, avoiding dinner with his father or brother. Further signifying the distance between him and his family members is his keeping of his mother's maiden name of Mabuchi, rather than changing it to his father's surname Tanaka. Kou resembles many other cold male leads in shoujo manga. His relationship and interactions with Futaba can be described as very "hot and cold" or "push and pull", creating confusion for Futaba who is unsure of his true feelings for her. In the manga, it is eventually revealed that Kou's hesitancy to admit his true feelings stems from not only the insecurity of his mom's death, but more importantly the obligation he feels for his friend Yui. Yui, a friend from his middle school in Nagasaki, shares similar familial experiences as he does. They both have divorced parents, and have lost one from cancer. 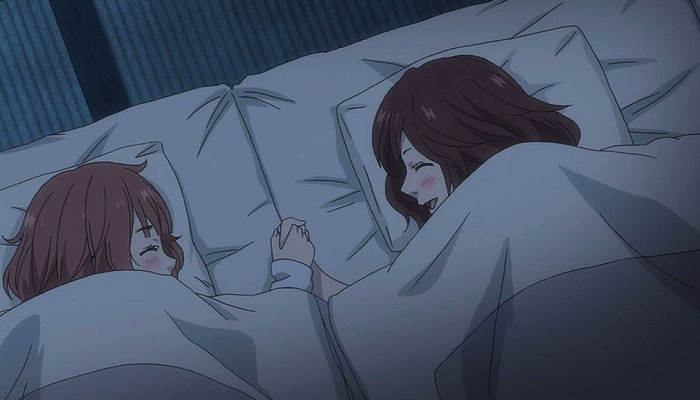 She has no other family members she can rely on after her father's death, so Kou feels an obligation to support her. In the end, regardless of the way Kou acts, we discover that he can actually get very jealous, especially if it has anything to do with Futaba's relationship with Touma. 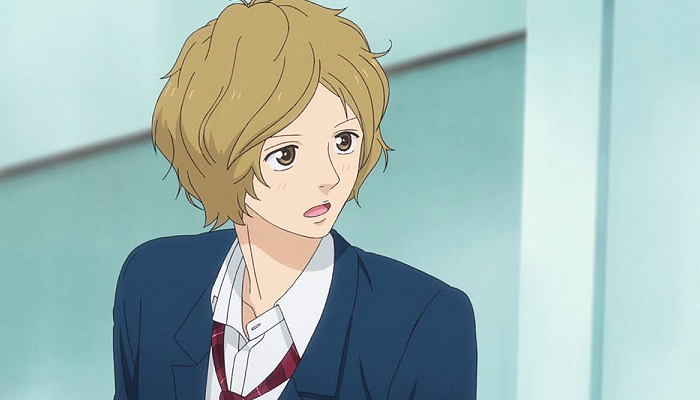 Luckily for the viewers of Ao Haru Ride, although the character has plenty of frustrating moments, he is the character that grows up and changes the most throughout the series. In the anime, this change primarily occurs when Futaba moves him by telling him how much their group of friends care about him, which opens him up a little bit. In the manga, several events do this. One such event is when he finally admits how much he likes Futaba, assisted by the meddling of Kominato. Further, he finally breaks off his connection to Narumi, whom he feels he has an obligation to. After this, he begins putting an effort to chasing Futaba, threatened by the possibility of losing her to someone else. Through this process, Kou becomes someone who is more determined, caring, happier, and a person who smiles more often. This change culminates in Kou changing his surname back to Tanaka, and even buying flowers for Futaba - something that you would not expect him to do. 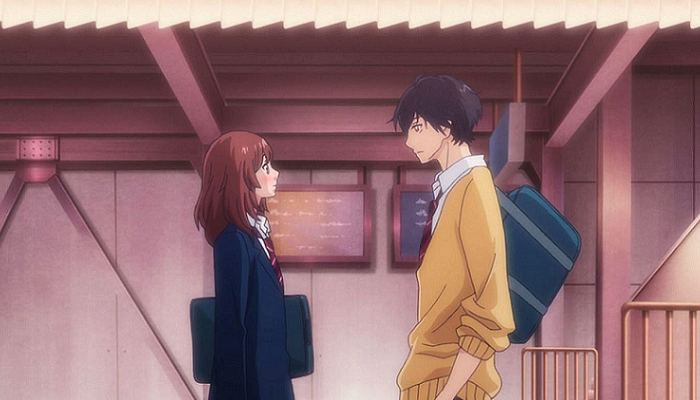 Kou's major hurdle in Ao Haru Ride is moving on from the past. This is embodied in not only his mother's death, but also by confronting Yui. This relationship keeps him attached to the painful memories of the past, unable to let him move on. Kou overcomes this, when he realizes how strong his feelings for Futaba are, and the need to break free from Yui's subtle manipulations, eventually severing his relationship with her. In the same class as Futaba in both years, Yuuri is a petite and cute girl who has been on the receiving end of spite and envy amongst the girls in her classroom. Although naturally shy around boys, her female classmates think otherwise and criticize her for "acting" the part for attention. She has a sweet temperament and thanks Futaba for talking to her when she didn't have to, even gifting her with a cute key chain, and eventually becoming her friend. Although her appearance may indicate otherwise, Yuuri shows insight. She asks, for example, what the difference is between the way she acts around boys, and the way other girls put effort into their appearance for attention. 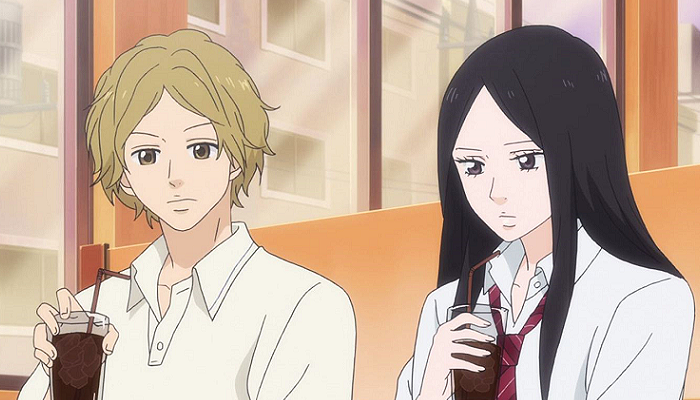 At one time she develops a crush on Kou after he helps her out during the school representative camp. Although Futaba later confesses that she likes Kou as well, Yuuri has no hard feelings and reinforces to Futaba that they'll be friends no matter what. Also knowing she has a slim chance of claiming Kou's heart if she is up against Futaba, she puts on a brave face and continues smiling. In the manga, more sides of her character are revealed. For example, at one point she becomes upset that Futaba won't admit her true feelings and confess to Kou, despite liking him and being rejected herself. After Futaba is rejected by Kou, she also participates (unwillingly at first) in plotting with Touma's friends to get Futaba and Touma together, as long as that means her dear friend is able to move on and find happiness. Overall, she looks out for her friends and their best interest. Shuko is quiet and keeps to herself, often emanating an aura that keeps people away, as shown when Futaba and Yuuri first encounter her in class. She eventually opens up after befriending the girls, admitting that they are the first people to call her by her first name, as well as being her first friends since entering high school. Futaba and Yuuri soon become people who she cares and looks out for. In the manga, it is revealed that she is a very perceptive and observant person, able to read situations presented to her, and is difficult to deceive. In many cases, she understands social cues, coming up with excuses to provide her friends alone time with their boyfriends, as she does for Yuuri and Futaba. She also holds a one-sided crush on Tanaka-sensei, Kou's older brother, but is aware of the risk this poses to his position as a teacher. This crush begins in her first year during a guidance session, in which she is moved by the advice he gives her, and his cheerfulness. Although rejected several times, she remains persistent. Yuuri happened to witness one such case during the class representative camp, being the first of the group to find out who Shuuko liked. Like Kou, she shares a similar challenge of opening up to people. Although not explained in the anime, her unwillingness to make friends and trust others stems from her experiences in middle school when she was betrayed and ostracized by a friend, despite doing what she thought was right. Fortunately, Futaba and Yuuri are able to prove to Shuuko the value of friendship. One of Kou's closest friends, Aya has the opposite personality. He is loud, outgoing, and brimming with enthusiasm. Although he appears as a relatively care-free and compulsive person, Aya is actually very caring and protective of his friends. He has a crush on Shuuko, which is revealed in the first scene in which he meets Futaba and Yuuri, during their first day in the same class. In the manga, the origins of his crush is revealed to stem from an incident in which Shuuko stands up for him when his classmates begin complaining about how annoying his loud and outgoing personality is, behind his back. Due to his interest in Shuuko, he starts out disliking Tanaka-sensei, the target of Shuuko's affections, seeing him as a sort of rival. This eventually changes throughout the series as Tanaka-sensei makes it clear he has no immediate interest. Unfortunately, not too much of Aya's character is revealed in the anime, so those who have watched it should read the manga to learn more about this character. For example, it is explained that the reason why Aya is so outgoing is because he was a very frail, timid, and weak-looking boy in his childhood. He was bullied because of this, and his girly name. With the encouragement of an old lady he calls "aunty," whom looked after him a lot when he was a child, he decided to change. This was especially because he felt a need to become someone to cheer up his sickly younger sister. Kou also goes as far as to state that Aya is a good person. 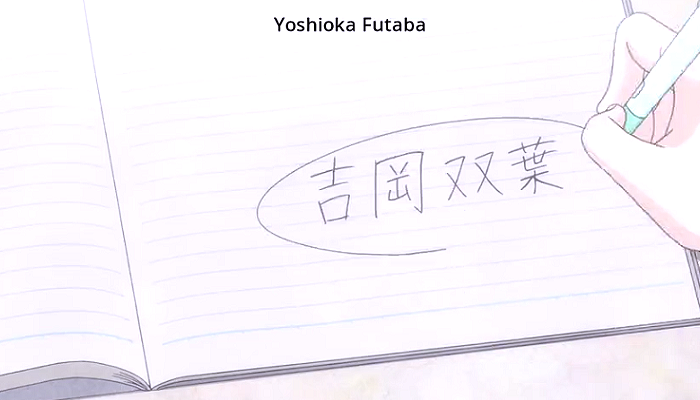 He is the first person Kou confides in about how he feels about Futaba. He is also the one to really bring Kou to his senses about his feelings, and encourage him to break off his connections to Yui, whom he felt was holding Kou back from moving on. Unlike the other characters, Aya is relatively free of the challenges that they face. He does mature as the series progresses. This culminates near the ending of the manga where he reflects on how Kou had acted. He states that he now understands how Kou must have felt when he lost his mother, after he loses his own mother figure, the aunty from the candy shop. A supporting character, Yoichi is Kou's older brother and teacher in the same school. Although he can have a childish streak, he is a professional who is concerned about the well-being of his students, and their learning. He gets along well with his students, always putting aside time to help them or listen to their worries. 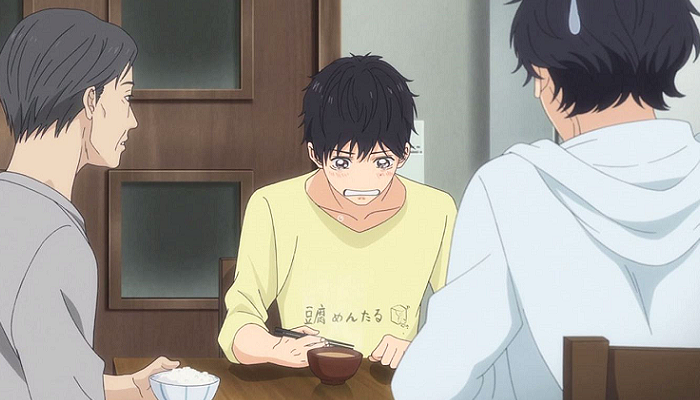 Despite looking very similar to Kou, few students actually realized that they were brothers, especially due to the fact that they don't share the same surname. Often volunteering to cook dinner for Kou, Yoichi is shown as a caring and concerned brother. They were especially close when they were younger, and he often reflects on how Kou has changed - from a young, clingy crybaby who adored his older brother, to the cold Kou now. When their parents got divorced, Yoichi stayed with his father, while Kou moved to Nagasaki with his mother. Yoichi is regretful that he wasn't able to do much to help when their mother died, and suspects this as the reason for Kou's detachedness around him. 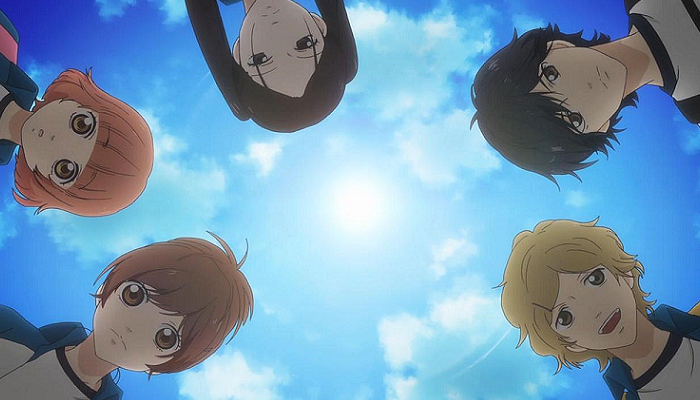 These are just the characters featured in the Ao Haru Ride anime. You may have noticed the mention of a "Touma" and a "Yui." These are characters that appear in the manga, and hold quite significant roles. So, to get the full gist of the relationships and interactions in Ao Haru Ride, do check out the manga! We're going to look at Ano de Natsu de Matteru characters and their relationships; and maybe learn from them how to be successful in interpersonal relationships, and how to win at life. Sukitte li na yo: Meet the Students of Toumei High! 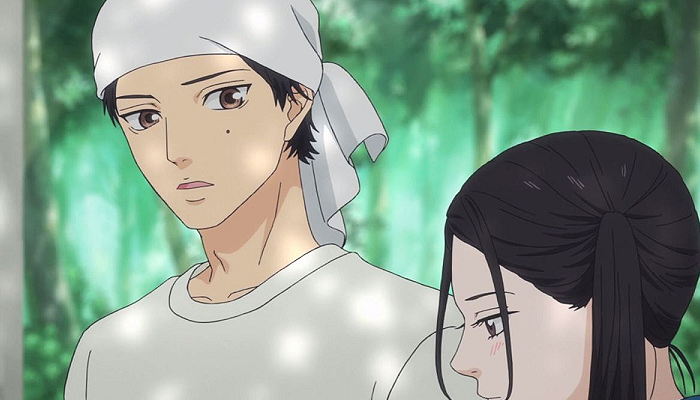 Toumei High School of Sukitte li na yo (Say I Love You) boasts a student population exploding with teenage angst and tender romance! 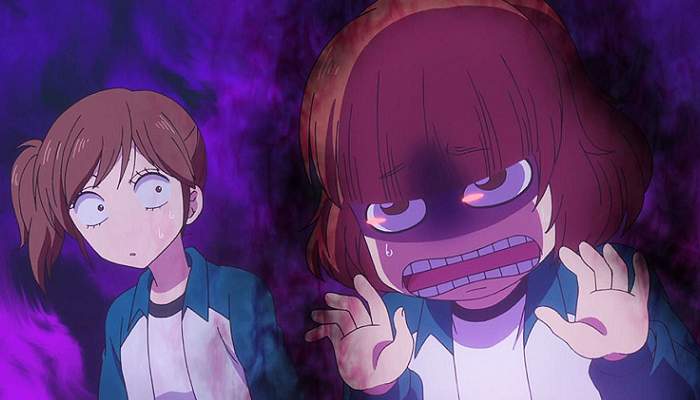 Take a look at some of the characters that make up a typical high school romance anime.